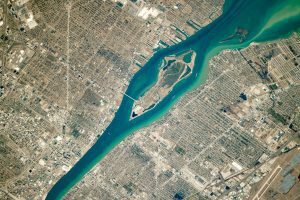 The Detroit River stretches approximately 45 kilometers (30 miles) and provides connectivity between the upper Great Lakes and the Saint Lawrence Seaway. Iron ore, mined from Michigan’s Upper Peninsula and northern Minnesota, makes up more than 50 percent of the commodities passing through the Port of Detroit. In the photo, a few large ships are visible passing along the narrow strait. 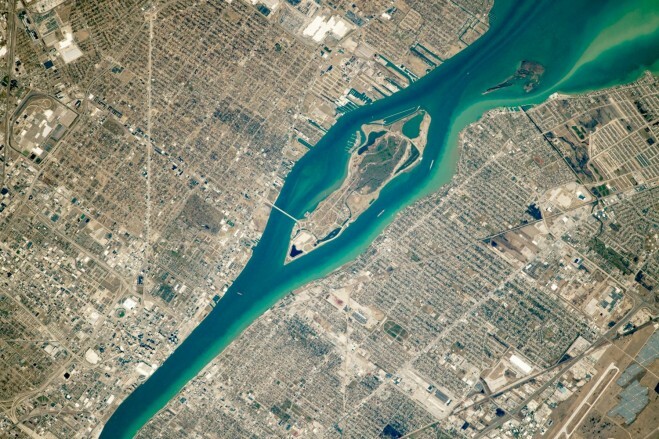 The river serves as the international border between the United States and Canada, following along the southern channel and making Belle Isle part of the United States. Belle Isle is a park with attractions including a museum, zoo, aquarium, conservatory and athletic fields. Since 1992, the island has been temporarily transformed into a raceway several times to host what is formally known as the Detroit Grand Prix. On the U.S. side of the river lies Michigan’s most populous city, Detroit, famously nicknamed the Motor City. Automobile production has driven the economy in Detroit and Windsor, Ontario, since the early 1900s, with the largest American automotive companies headquarters around and within Detroit. More than 2 million motor vehicles per year have been produced in Michigan in nearly every year since 1990. 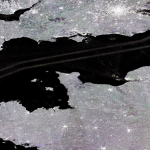 The Detroit-Windsor international crossing has the highest number of freight truck containers passing across the U.S.-Canadian border each year, with automobiles and vehicle parts being one of the top commodities.